Kids being kids. Sometimes it’s not always so simple. So helping children find their voices, the ability to play and engaging with with their friends and families is what we work for. Together, with families, we find ways to help the children we serve to shine. There are so many amazing children that reward us with their smiles and charm every day. JJ is is one of those stars! We are so pleased to have JJ as an Honorary Ambassador for Walk With Me this year. When asked to describe JJ, his mom summed it up by saying that he’s a rock star. This very social five-year-old has PVL, cerebral palsy and vision impairment. JJ has tremendous inner strength and we have to believe so much of it comes from his parents, big sister, twin brother and huge extended family. When he was ready for center-based services, he also became part of the Easter Seals family. 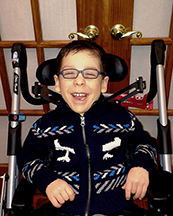 Since he began at Easter Seals, JJ has come out of his shell even more, his motivation is increased, his words have increased and he is holding his head up better. In addition to his increased words, he will soon be using an eye gazing device to really help him find his voice. When he’s not amazing his teachers, he’s quite happy rough housing with his brother, playing catch, looking at Elmo books, strumming a guitar or even better, enjoying a bowl of ice cream. JJ certainly knows how to enjoy the finer things in life and we can’t wait to see what he does next! This entry was posted in child stories and tagged cerebral palsy, Easter Seals, eye gaze software, PVL, vision impairment, Walk With Me on May 30, 2014 by Easterseals.